The 72–WF has been replaced by the new 72–WB and we recommend the 72–WB for all new customers. The 72-WB provide additional capabilities at the same price – click here for the 72-WB. There are limited quantities of the 72-WF still available. If you are still interested in purchasing this model, please call us at 1-800-956-4437 or email us at sales@dataloggerinc.com for pricing and delivery information. 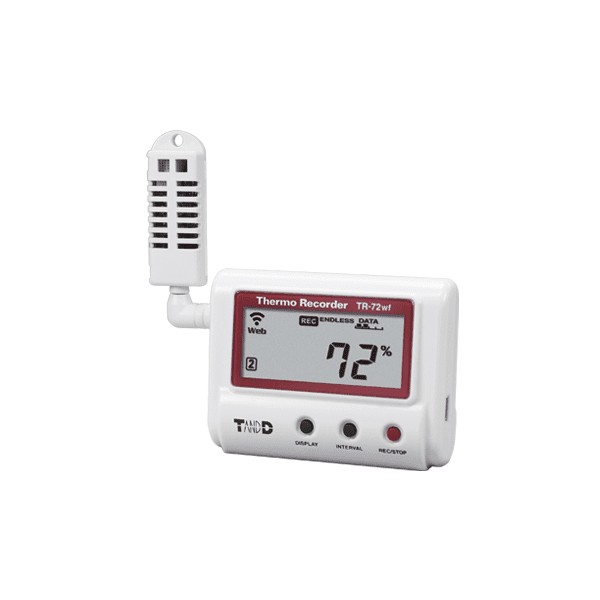 The TR-72wf WiFi Temperature Humidity Data Logger is a 1 channel humidity & 1 channel temperature measurement model with an external thermistor sensor and a measuring range of 0 to 55°C and a humidity range of 10 to 95% RH. In addition to the standard features such as battery operation and USB communication (through optional cable, sold separately), the TR-72wf supports communication with mobile devices. By using T&D’s WebStorage Service, users can access stored data anytime from the cloud.